Intel has a long history of leading the industry in I/O innovation. In the late 1990s, Intel developed USB, which made it easier and faster to connect external devices to computers, consolidating a multitude of existing connectors. Intel continues its I/O innovation leadership with Thunderbolt™ 3, one of the most significant cable I/O updates since the advent of USB. Intel’s vision for Thunderbolt was not just to make a faster computer port, but a simpler and more versatile port available to everyone. We envision a future where high-performance single-cable docks, stunning photos and 4K video, lifelike VR, and faster-than-ever storage are commonplace. A world where one USB-C connector does it all – today, and for many years to come. With this vision in mind, Intel is announcing that it plans to drive large-scale mainstream adoption of Thunderbolt by integrating Thunderbolt 3 into future Intel CPUs and by releasing the Thunderbolt protocol specification to the industry next year. With Thunderbolt 3 integrated into the CPU, computer makers can build thinner and lighter systems with only Thunderbolt 3 ports. For the first time, all the ports on a computer can be the same – any port can charge the system and connect to Thunderbolt devices, every display and billions of USB devices. Designs based on Intel’s integrated Thunderbolt 3 solution require less board space and reduce power by removing the discrete component needed for existing systems with Thunderbolt 3. In addition to Intel’s Thunderbolt silicon, next year Intel plans to make the Thunderbolt protocol specification available to the industry under a nonexclusive, royalty-free license. Releasing the Thunderbolt protocol specification in this manner is expected to greatly increase Thunderbolt adoption by encouraging third-party chip makers to build Thunderbolt-compatible chips. We expect industry chip development to accelerate a wide range of new devices and user experiences. “Apple and Intel have collaborated on Thunderbolt from the beginning, and as the industry leader in its adoption, we applaud Intel’s efforts to integrate Thunderbolt technology into its CPUs and open it up to the rest of the industry,” said Dan Riccio, Apple’s senior vice president of Hardware Engineering. Microsoft has enhanced Thunderbolt 3 device plug-and-play support in the now available Windows 10 Creators Update. Intel and Microsoft plan to continue to work together to enhance the experience in future versions of the Windows operating system. In addition to support from Apple and Microsoft, Thunderbolt 3 has already gained significant adoption with more than 120 PC designs on systems with 7th Generation Intel® Core™ processors, the latest MacBook Pros and dozens of peripherals – expected to ramp to nearly 150 by the end of 2017. 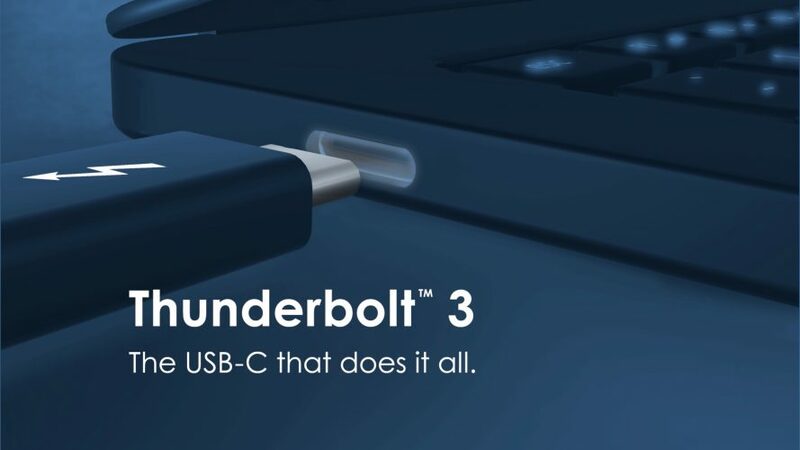 Well on our way to achieving our vision, let’s explore a few scenarios where Thunderbolt 3 is changing the PC experience and creating new expectations for what’s possible. Mobile platforms continue to get thinner, lighter and more powerful. The challenge? A simple and universal way to unleash the full performance of these mobile devices when docked. Today, business and home users are forced to choose between performance and mobility. Thunderbolt 3 docks enable mobility without compromise. Some people are more productive with a large high-resolution monitor, and others with multiple monitors. Only Thunderbolt 3 docks support both, while simultaneously transferring large files and charging the notebook. Other people want a simple way to play and create, and Thunderbolt 3 docks can connect to any compatible peripheral or display, avoiding confusion. The power Thunderbolt 3 brings to docking is speed and simplicity. Some of these products are available now for less than $200. The amount of data the average person creates, uses and saves these days is exploding. For example, taking 1,000 high-resolution photos can quickly create over 20GB of data. Likewise, shooting an hour of 4K video from a drone can generate a jaw-dropping 1.5TB of data. It could take hours to transfer this data to storage via conventional methods. In order to speed up data transfer, storage makers are shifting from slower Serial ATA (SATA) drives to non-volatile memory (NVMe) SSDs for higher speed and lower latency storage solutions. For any media lover or YouTuber generating large amounts of data, there is often a great need for external storage that is as fast as the internal SSD to expand capacity. Since only Thunderbolt can connect NVMe SSDs to your PC, Thunderbolt 3 storage fulfills this need and enables people to save time with data transfers that happen in a snap. A full 4K movie can be transferred in less than 30 seconds. Gaming desktops will continue to offer best-in-class performance for the ultimate gaming experience. And gamers who want to combine mobility and performance gaming in one device can use Thunderbolt 3 to do so. With Thunderbolt 3, gamers can travel, work or enjoy long hours at a coffee shop with a thin and light notebook. Then, when it’s time for epic gaming, the notebook can be paired with a Thunderbolt 3 external graphics box to get a GPU boost for higher resolution and settings experience. When a person experiences virtual reality, they are fully immersed in a different world. The higher the resolution, the better the experience. To date, that has required multiple cables to transfer the experience from the PC to the headset in real time for 2K resolution. Only Thunderbolt 3 can deliver up to 4K resolution in virtual reality with a single cable. The benefits are endless – simplicity to performance to versatility – as Thunderbolt 3 becomes an essential part of our digital world by creating a universe of possibilities. 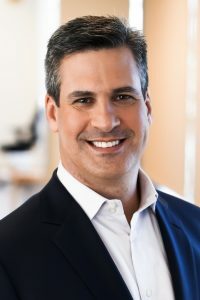 Chris Walker is vice president of the Client Computing Group and general manager of the Mobility Client Platform​ at Intel Corporation.